The PDP Versus Pad was originally available as the PDP Marvel Versus Pad. I feel it's necessary to point that out, because I'll admit that when the pad first came out, that was one of the two factors which made me decide against picking one up. The other, of course, being the expensive $39.99 price tag for a controller for a maximum of four or five games. I've since discovered that this was a terrible mistake on my part. Now, before I begin, let me state two things: I know that Hori Sticks and Sanwa parts for modding Mad Katz controllers are far more expensive than even the $39.99 MSRP that was one half of the reason that I'd refused to pick one up. But from my point of view, it was pretty pricey for something I'd never used, and thus, never experienced the drastic change. So if the price was the only thing stopping you, you're in luck: The PDP Versus Pad (sans the ugly Marvel artwork) is currently $15.00 off at Canadian EB Games locations. I asked about the pad, just by chance, and was informed of the discount. So since PDP is probably discontinuing the current pads to re-issue them in time for Ultimate Marvel vs. Capcom 3 in a couple months, now might be the time to pick one of these up. Now, like I said. Up until now, I've been using a regular Xbox 360 controller for my fights. Sorry, not a regular controller: A PDP Afterglow controller, which, while possessing a slightly more responsive d-pad, was not designed for fight games. To say that I was used to loose controls is a bit of an understatement. I've gotten so used to the loose controls that a portion of my fighting style was based entirely around the Shroedinger principal: Will it be a Hadouken or a Shoryuken? Who knows? I sure as hell don't! And to be fair, based on how well I'd done on Xbox Live, I'd assumed this was the norm. I surely couldn't claw my way up to occasionally thrashing B-ranks if it was just the pad, right? Wrong, apparently. To say that I've noticed an increase in my playing ability with this clickity-clackity pad would be an understatement. 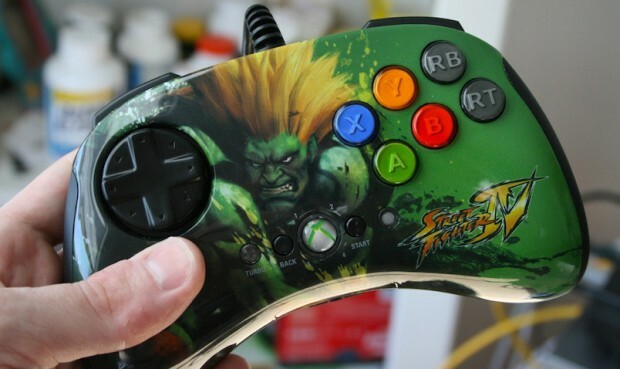 Now, I've heard some people complain about the fact that the controller is designed so that the six-button layout includes the LB and RB instead of the more common RB and RT layout depicted on the Blanka MadKatz fight pad above. To be honest, I can't foresee it being a problem for anyone who plays at home: Just change the settings once and you're good to go. If you can't figure that much out, you're probably not the sort who would benefit from it anyway. I guess I can see it being a problem if you're the sort who takes their pad to a friend's place to play, presuming there's more than two of you and you're all very specific about your controllers. But if you're that devoted, you've probably got a Hori stick, or a custom Sanwa or Seimitsu stick anyway, so this cheap pad is not for you. I'll admit that right now, it feels a little light. I don't think it's a problem with durability, (or I hope that it's not), but the controller feels far too lightweight to be comfortable. I'm hoping that this has more to do with the lack of rumble and (for a fight pad) extraneous components like the two analog sticks, but I've got the feeling time will tell on that count. The bottom line is that if you're spending a couple hours a week playing fighting games and plan to pick up Street Fighter X Tekken, you should probably pick up this fight pad. I know I don't regret it.